these panel trucks always just seem so plain, especially when painted all one color. 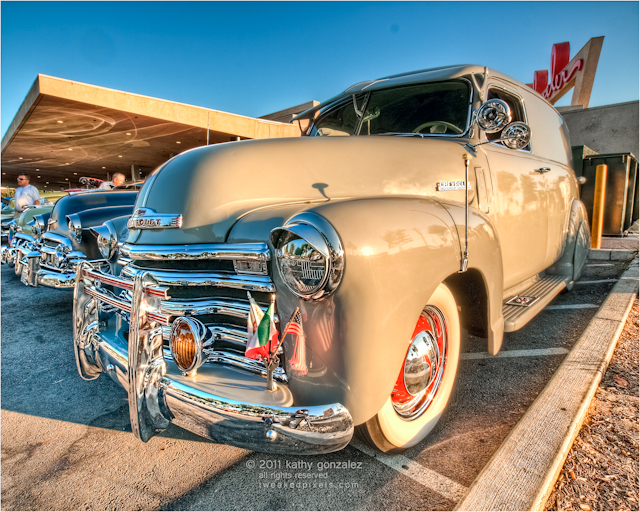 but i really liked this one parked in the corner at the broiler, at the end of a row of chevys. i think this bunch were actually together. maybe not a club, but definitely seemed to know each other really well. i'm not sure if it was the owner, but some dude was just sitting in the passenger side. when he realized i was setting up to take a shot, he kinda scrunched down in the seat. eh, fixed that by going to a low angle instead, when one of his buds decided to go up to his window for a chat. i figure if you see me setting up a tripod and don't skeedaddle out of your car, you want a portrait taken. usually a glare on the window or the shadows of the interior will hide their identity. i can choose to pull you out of the dark or not, sometimes out of the glare, but the car is the star, and you're just collateral damage if you just sit there.